CLEVELAND (KGO) -- Donald Trump's wife is being praised by some for her speech at the Republican National Convention on Monday night. But 30 seconds of her speech seemed very familiar to lots of people. The portion of Melania Trump's speech that's being scrutinized focuses on integrity and hard work. For 30 seconds, her speech is almost identical to what Michelle Obama said at the 2008 Democratic National Convention in Denver. And her speech isn't simply similar because of the words. It's similar in pacing too. This was supposed to be a grand introduction for a possible first lady. 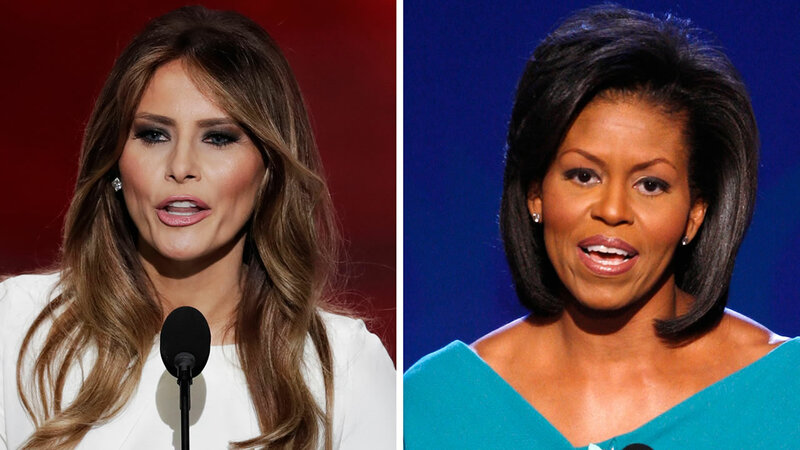 "I don't think Melania Trump is at fault," said ABC7 News Political Analyst Carla Miranucci. "It's whoever helped her write the speech and whoever failed to vet the speech. And that just shows the inexperience of the Donald Trump campaign." Accusations of plagiarism in political speeches are not new. In 1988, then Senator Joe Biden was accused of lifting a passage from a speech delivered months earlier by a brattish politician. He ended that run for president. But the Trump campaign isn't even acknowledging a gaffe. Donald Trump Jr. told ABC News there's no need to apologize. But internet commentators are having a field day. Memes and hashtags quickly skewered Trump. And political humorists are gleefully soaking up the comedy material. "It's the fault of the liberal media for unfairly maligning the writing skills of fashion models everywhere," joked Bay Area political comedian Will Durst. House Minority Speaker Nancy Pelosi criticized the Trumps for building a campaign built on mocking President Obama's tenure. "Well, I don't believe in what they believe in, but I'm going to use their words in my speech," she said. "There's something wrong with that." But in the end, the campaign says no one will be fired for the speech. ABC7 anchor Reggie Aqui and reporter Laura Anthony are reporting live from the RNC in Ohio. You can follow them on social media: Click here to follow Reggie on Facebook and click here for Twitter. Track Laura Anthony on Facebook here and follow her Twitter here. For full coverage of the 2016 RNC, click here, and click here for full coverage on the presidential race.